The tram, adorned in a blanket of graffiti, makes its first stop since I stepped on. The tired doors creak open to reveal the mall. Home to all the foreign cuisine and expensive clothes shops in Sarajevo, its glass windows, doors and walls scream modernity. It is a distinct contrast to what the tram passes minutes later: streets defined by buildings of beige, peach, cream and grey, littered with bullet holes and cavities formed from shell blasts. Here it would seem as if the war had ended mere weeks back, rather than twenty years ago. I look past these stark reminders of the atrocities that occurred and see Mt. Trebevic in the not-so-distant distance. 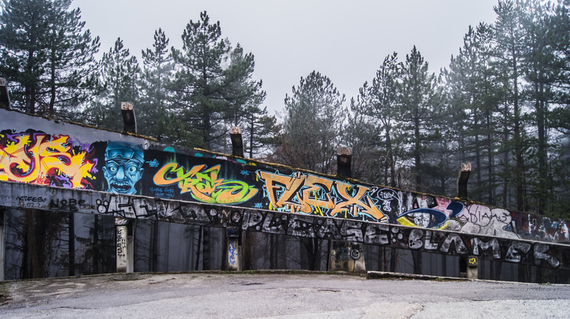 Today it is predominantly a spot for travelers to admire the view of Sarajevo or the graffiti on the slopes of the abandoned bobsled track, but it was once the centerpiece for the 1984 Yugoslav Winter Olympics, in which the winners for bobsleigh were two countries that no longer exist (East Germany and the Soviet Union). 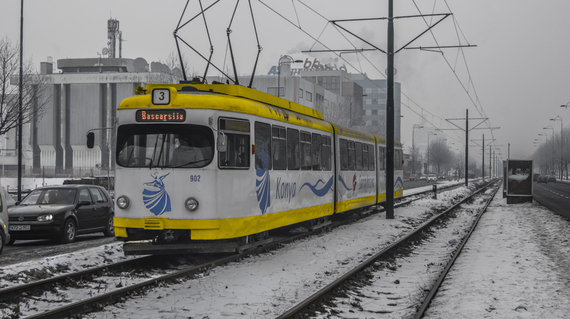 The tram jolts forward as it stops at Skenderija. Again, the doors creak open. No one gets off. A dark-haired man in a thick leather jacket, probably in his early twenties, holds the doors open for an elderly lady with a head wrapped in a floral scarf, who struggles up the step. The view out the dusty tram window begins to blur as we start to move. I take a look at the streets now, and, in particular, the buildings on them, and I am taken even further back in time to 1880. The rulers of Bosnia's Austro-Hungarian occupation had recently erected halls, streets, buildings and bridges, including the bridge where Gavrilo Princip assassinated Archduke Franz Ferdinand in 1914 -- the event that acted as a catalyst for World War I and the fall of the Austro-Hungarian Empire. The hub of Stari Grad is Baščaršija. Baščaršija is Sarajevo's old bazaar, or, to be precise, Sarajevo's 554-year-old bazaar. It was built and used under Ottoman rule, and as I walk through the narrow streets and alleyways I feel like I have stepped through a time machine once more. The shops and stalls that line the streets and alleyways are all stocked with items reminiscent of the once-thriving Turkish empire. There are rows and rows of shisha pipes with a vast range of colors and designs, their sizes ranging from smaller than my hand to bigger than my sister. There are stacks of copper and porcelain coffee sets far too elaborate and confusing for a non-coffee drinker like me. There are scarves and scarves and scarves of beautiful intricate floral, scroll, and paisley patterns. Feeling peckish, I eat a plate of burek -- a meaty, flaky pastry of greasy deliciousness; a true staple of Bosnian cuisine. On my way out I buy a small, sugary cube of rahat lokum (Turkish delight), ending the story on a sweet note. Elliot Wier is a student at THINK Global School. Find more of his photography at 500px.